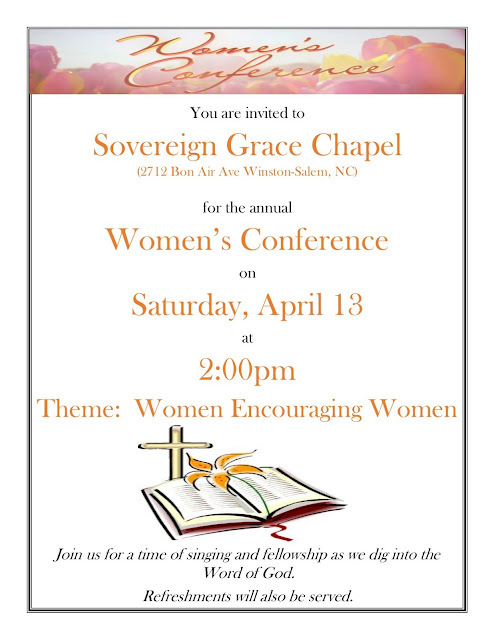 Our annual Women's Conference is a time of "Women Encouraging Women" through singing, hymns, ice breaker activities, fellowship, discussions, and most importantly digging into the Word of God together. This year we have two speakers, Sister Eunice Fries, a Sunday School teacher from our church in Winston-Salem, Sovereign Grace Chapel, and Sister Brenda Atkinson, the wife of the pastor and a leader in the Women's Ministry at Word Fellowship Reformed Baptist Church in Greensboro, NC. Our colors are orange and cream. The conference will wrap up with a time of refreshments as we continue our fellowship and reflect on the truths we heard through the Scriptures.